Botulism is a paralytic disease caused by the neurotoxins of Clostridium botulinum and, in rare cases, C butyricum and C baratii. These gram-positive spore-forming anaerobes can be found in soil samples and marine sediments throughout the world. With a lethal dose to humans of less than 1 mcg, botulinum toxins are the most poisonous substances known and pose a great threat as an agent of biological warfare. It is estimated that one gram of aerosolized botulism toxin has the potential to contain 1.5 lethal doses. Botulinum toxin is classified by the Centers for Disease Control and Prevention (CDC) as one of the six highest-risk threat agents for bioterrorism because of the high lethality, ease of production and transport, and need for prolonged intensive care treatment. Investigations of Clostridium neurotoxin as a biological weapon have been carried out by various nations. The Japanese in World War II carried out human experiments on prisoners in Manchuria. Also in World War II, the British secretly used a botulism-impregnated grenade in the assassination of a German Gestapo officer. The United States studied botulinum toxin as a military bioweapon until President Nixon signed the Biological and Toxin Weapons Convention in 1972, ending all US biotoxin weapons research. Iraq and the Soviet Union stockpiled neurotoxin, with Iraq admitting to weaponizing thousands of liters of toxin in warheads after the 1991 Gulf War. An attempt at terrorist use of Clostridium toxin in the early 1990s by the Japanese Aum Shinrikyo cult against American military targets was unsuccessful. The term botulus is derived from the Latin word for "sausage." An outbreak of clostridial "sausage poisoning" in Europe in the late 1700s was responsible for many deaths. A German physician, Dr. Justinus Kerner, published the first case descriptions of botulism in 1822, with experiments conducted on himself and laboratory animals. Investigation and confirmation of poor canning practices as the cause of outbreaks of food-borne botulism occurred in the 1920s. Food-borne botulism follows the ingestion of preformed toxin in foods that have not been canned or preserved properly. Wound botulism, caused by systemic spread of toxin produced by organisms inhabiting wounds, is associated with trauma, surgery, subcutaneous heroin injection, and sinusitis from intranasal cocaine abuse. Infant botulism results from intestinal colonization of organisms in infants younger than 1 year. In this age group, normal intestinal flora may not have developed to the degree that prevents colonization by these organisms in healthy adults. Adult intestinal colonization botulism is similar in pathogenesis to infant botulism. This form occurs in older children and adults with abnormal intestinal function or anatomy, such as colitis, intestinal bypass procedures, or other conditions that may create local or widespread disruption in the normal intestinal flora. Injection-related botulism is a result of inadvertent misadventures with injection of therapeutic pharmaceutical botulinum toxin. Inhalational botulism has recently been described. To date, the only human cases have been the result of inadvertent inhalation of toxin by laboratory workers. However, aerosolization and inhalation of botulinum toxin is considered a likely method for poison delivery in a bioterrorist attack. Differences in antigenicity among the toxins produced by different strains of botulism-causing organisms allow for separation of the organisms into 7 distinct types (A-G). Types A, B, and E are the toxins most often responsible for disease in humans, whereas types C and D only cause disease in other animals (eg, nonhuman mammals, birds, fish). In rare instances, a single strain of organism may produce 2 toxins. As alluded to earlier, clostridia other than C botulinum have been associated with a handful of cases of botulism. These include reports of food-borne and infant botulism associated with type E toxin produced by C butyricum. Adult and infant intestinal colonization botulism, associated with type F toxin-producing C baratii, has been documented. For more information, see Medscape's Bioterrorism Resource Center. Food-borne botulism, the first form of the disease to be identified, is responsible for approximately 1000 reported annual cases worldwide. While European cases most commonly are associated with type B contamination of home-processed meats, Alaskan, Canadian, and Japanese outbreaks often involve type E toxin in preserved seafood. Chinese cases involve type A toxin in home-processed bean products. A recently described case in Thailand was associated with ingestion of home-preserved bamboo shoots. The toxin type most often responsible for food-borne illness corresponds well with the geographic distribution of the toxigenic species. Type A is most common west of the Mississippi, type B east of the Mississippi, and type E in Alaska. Toxin type A produces a more severe illness than type B, which in turn is more severe than type E.
By far, home-processed foods are responsible for most (94%) outbreaks of food-borne botulism in the continental US. In fact, of the 6% of outbreaks caused by mass-produced commercial foods, most cases were attributed to consumer mishandling of commercial products. Infant botulism occurs in children younger than 1 year, with 95% of the cases occurring in patients younger than 6 months. Peak susceptibility is in the 2- to 4-month range. In the 16 years following its identification in 1976, 1134 cases of infant botulism have been recorded in the United States. With approximately 60 cases of infant botulism reported each year, it is now the most frequently occurring form of botulism. The disease is most common in the western part of the United States. One half of all annual cases are reported in California, where the frequency of the toxin responsible is distributed equally between types A and B. While the toxin types of food-borne botulism seem to reflect the distribution of toxigenic strains in the environment, the frequency of type B toxin in infantile botulism is disproportionately high. Although the case-fatality ratio for infant botulism in the US is less than 2%, the disease is suspected to be responsible for up to 5% of sudden infant death syndrome cases in California. Although the ingestion of honey has been identified as a strong risk factor for the disease, it is found in fewer than 20% of case histories (and only 5% of case histories in California in recent years). Other risk factors that have been reported include infants with higher birth weights and mothers who were older and better educated than the general population. Another reported risk factor was a decreased frequency of bowel movements (< 1/d) for at least 2 months. Breastfeeding was associated with older age at onset of illness in type B cases. Through 1992, only 1-3 cases of wound botulism were reported in the US each year. Two thirds of these cases were type A and almost one third were type B. One half of all cases were reported from California. In recent years, the number of reported cases of wound botulism has risen dramatically, with 11 cases in California in 1994 and 19 cases confirmed by the State Department of Health Services during the first 11 months of 1995. All but 1 of 40 cases reported in California, at this writing, involved drug abusers, many with subcutaneous injection or skin-popping of heroin. Cases of adult colonization botulism have been increasingly reported in the literature. In some of these cases, C botulinum organisms, but no preformed toxin, could be found in foods the patients had ingested. These cases were associated with a prolonged latent period of up to 47 days postingestion before onset of symptoms. In one study, 2 of 4 patients had surgical alterations of the gastrointestinal tract that may have promoted colonization. Jejunoileal bypass, surgery of the small intestine, and Crohn disease are among other reported factors predisposing adult patients for intestinal colonization. 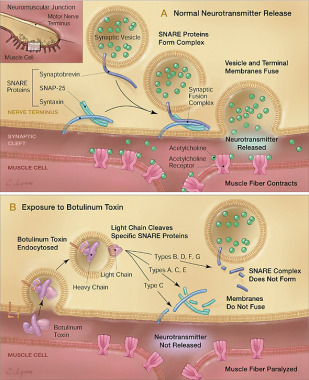 Only rare cases of injection-related botulism have been reported, despite the increasingly common use of botulinum neurotoxin in neurology, ophthalmology, and dermatology practices. The standard packaging mandated by the FDA contains doses that are well below the human toxic level. C botulinum is distributed widely throughout the environment and can be found in soil, freshwater and saltwater sediments, household dust, and on the surfaces of many foods. The toxins produced are cytoplasmic proteins (mass = 150 kd) released as cells lyse. The spores will germinate and bacterial growth and toxin elaboration occur in an anaerobic, low-salt, low-acid environment. The toxin is destroyed by heating to 85 ° C for 5 minutes and the spores are inactivated by heating to 121 ° C under pressure of 15-20 lb/in2 for at least 20 minutes. Although the mode of entry of toxin may differ between the different forms of diseases, once the toxin enters the bloodstream, it acts in a similar manner to produce the clinical symptoms. The toxin binds to receptors on presynaptic terminals of cholinergic synapses, is internalized into vesicles, and then is translocated to the cytosol. In the cytosol, the toxin mediates the proteolysis of components of the calcium-induced exocytosis apparatus (the SNARE proteins) to interfere with acetylcholine release. Blockade of neurotransmitter release at the terminal is permanent, and recovery only occurs when the axon sprouts a new terminal to replace the toxin-damaged one. This process is shown in the illustration below. The effects of the toxin are limited to blockade of peripheral cholinergic nerve terminals, including those at neuromuscular junctions, postganglionic parasympathetic nerve endings, and peripheral ganglia. This blockade produces a characteristic bilateral descending paralysis of the muscles innervated by cranial, spinal, and cholinergic autonomic nerves but no impairment of adrenergic or sensory nerves, and no central nervous impairment. The classic syndrome of botulism is a symmetrical, descending motor paralysis in an alert patient, with no sensory deficits. For food-borne botulism, patients with an early onset of clinical symptoms (within 36 h of toxin ingestion), index patients in food-borne cases, and patients older than 60 years generally have a longer clinical course than their counterparts. Deaths occurring within the first 2 weeks of botulism are most often due to failure to recognize the severity of disease or from pulmonary or systemic infection. The average duration of respiratory support for those requiring mechanical ventilation is 6-8 weeks but may be as long as 7 months. For food-borne botulism, severity of disease seems to be associated with toxin type. Intubation is required for 67% of patients with type A botulism, 52% of patients with type B, and 39% of patients with type E. In addition to being more likely to need ventilatory support, patients with type A botulism tend to see a physician earlier and have a longer course of illness than those with type B botulism. The case-fatality rate for type A botulism is 10%, twice that of type B.
Ventilatory and upper airway muscle strength, along with exercise performance, predominantly build within the first 12 weeks, and most patients are back to normal within 1 year with type A botulism. Dyspnea, fatigue, and decreased maximal workload are common 2 years after type B intoxication, although lung function tests have returned to normal. The overall case-fatality rate is approximately 7-10%. For patients older than 60 years old, the fatality rate is approximately doubled. The mortality rate is lower for patients who receive prompt antitoxin compared with those with delayed treatment. Infant botulism progresses for 1-2 weeks and stabilizes for 2-3 weeks before recovery begins. The average length of a hospital stay for infants is approximately 1 month, although excretion of toxin and organisms may continue for more than 3 months following discharge. The infant case-fatality rate (1.3%) is low compared to food-borne illness, but a 5% relapse rate is associated with infant botulism after apparent resolution of clinical symptoms. The occurrence of an episode of botulism does not necessarily confer immunity toward subsequent episodes. Immunization in the form of a pentavalent toxoid is available, but it is used only for those in high-risk areas such as laboratory workers and certain military personnel. It requires yearly boosters to remain protective.